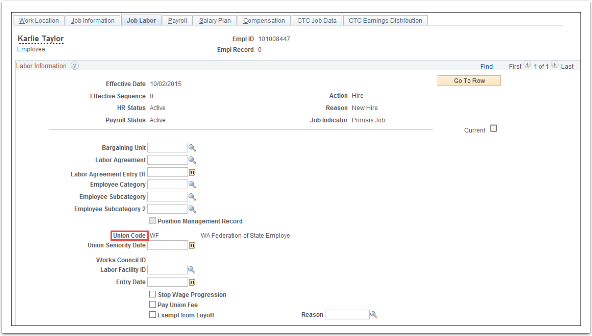 Purpose: Use this document as a reference for how to add a person/employee and a job instance in ctcLink. IMPORTANT: Before you begin this process, be sure to perform the Search Match process to verify if the person has an existing Employee ID. Begin by navigating to the Add a Person page. 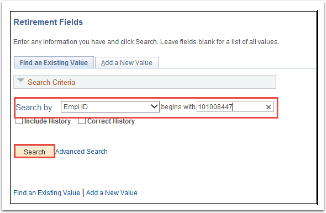 The Person ID value will default to NEW; leave as is if the person does not have an existing Empl ID based on your Search/Match results. The Effective Date will default to Today's Date, change if applicable. (This is the date the person will now exist in PeopleSoft, there is no Job or Institute assigned to the person here). Select the Format Type drop down menu and select English. Select the Add Name button, then click in the First Name field. Enter the appropriate information into the First Name field. Enter the appropriate information into the Last Name field. Select the Refresh Name button, then click OK. Select the Date of Birth field and enter the appropriate information. *Note: Leave the Birth State and Birth Location fields blank. Birth Country auto-populates to USA. 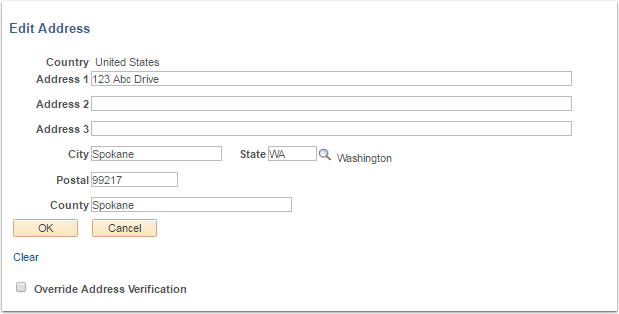 Select the National ID field, and enter the social security number into the blank field. Select the Contact Information tab. Select the Add Address Detail link. The Address History page will appear. Select the Add Address link. The Edit Address page will appear. Select a State from the lookup icon. Enter the Postal (Zip) Code. Warning: If the system does not recognize the address it will list potential alternatives. Click the Override Address Verification box to bypass. The system will direct you back to the Address History page. This time the address you entered will display on the page. The system will redirect you to the Contact Information tab. In the Phone Information enter the details regarding the phone contact. Select the Phone Type from the drop-down menu. Select the Preferred check box. In the Email Address section, enter the details regarding the email account. Select the Email Type from the drop-down menu. IMPORTANT: In order for new employees to receive email notifications through ctcLink (a vital part of the absence management process etc. ), their Primary Email Address needs to be set up in the User Profile area of PeopleSoft. You will not have access to this area. However, you must add this Primary email address in the biographical area in addition to any other email addresses you may include. It does not need to be checked as Preferred, but should be entered as Campus. Contact your Local Security Administrators at your college for this address. This is important as the Primary email address (e.g. Bsanders@sbctc.edu) drives Workflow and is located in the User Profile (security) area. Local Security Administrators may or may not have the ability to update the User Profile in PeopleSoft, however they will be able to tell you what the Primary email address will be. 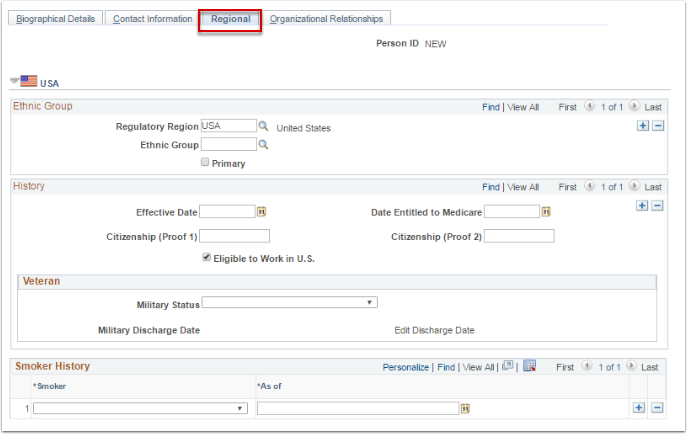 Since the User Profile is automatically generated each night and is updated based on who was hired earlier that day, best practice is to add the employee record in HCM on the same day as the Primary email address is entered in the User Profile area. If it is not entered on the same day, and your Local Security Administrator does not have access to this area, they will have to log a Service Ticket and Olympia ERP staff will update the User Profile. If they do have access, they can update the User Profile for you after the fact. To efficiently set up the primary email address both in the User Profile and in the Biographical areas, your college should develop, and communicate, an internal business process that will ensure that this setup is not missed when you onboard an employee. Select an Ethnic Group from the lookup icon. Tip: Use the fields in the History section to track your I-9 information. Select a Military Status from the drop-down menu. If you select a discharge related option, the system will require the Military Discharge Date. 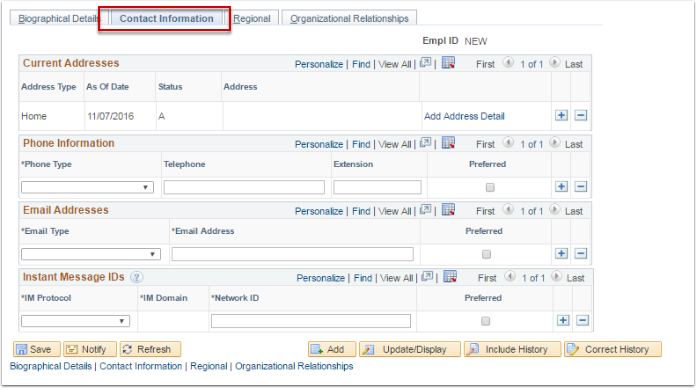 Select the Organizational Relationships tab. NOTE: the Smoker History section is optional. The fields do not feed into any other tables. Select the Select Checklist Code list; select HIRE. Select New Hire from the Reason drop-down menu. Alternately, if this person is a Re-hire versus a first time hire, you should select this from the Action field drop-down menu. Enter or select the desired position by clicking the Position Number lookup icon. Select or enter the Establishment ID. Select the Job Information tab. Select the Supervisor ID lookup icon to select the supervisor for the new hire. 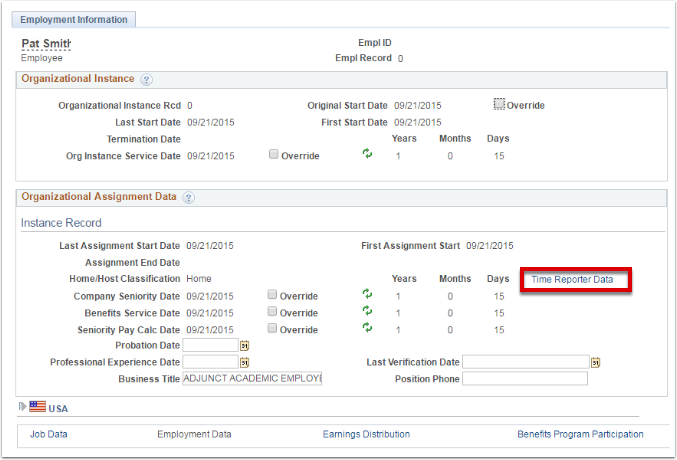 Select the Empl Class drop-down menu and select the appropriate classification for the new hire. Select the Job Labor tab. Enter the Union Code on the Job Labor page, if applicable. NOTE: The Union Code will auto populate if it is included in the Position. The Payroll System field defaults to Payroll for North America. 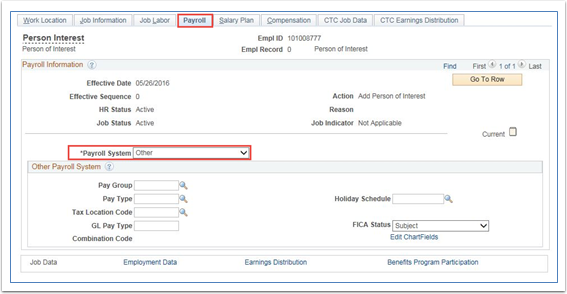 IMPORTANT: For Volunteer/Person of Interest (POI) type employees, you MUST select the Payroll System of Other from the drop down selection. This will cause the pay group field to be blank and prevent the employee pay data from pushing to Payroll. 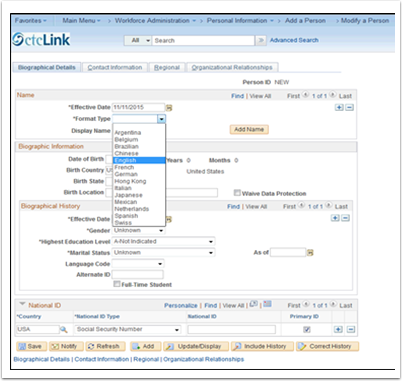 Select the Absence System drop-down menu and select Absence Management. 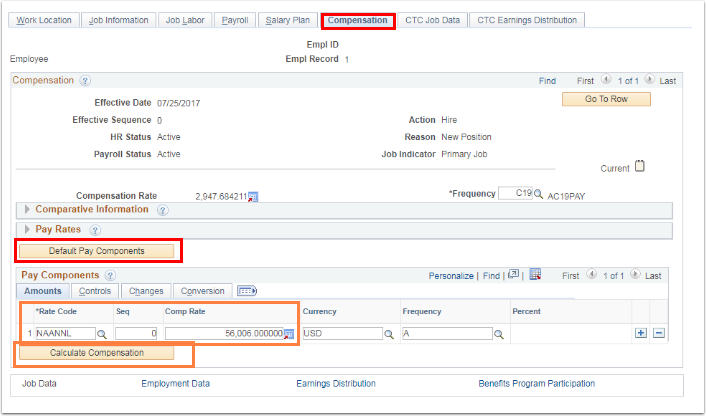 Select the Pay Group lookup icon and select the pay group for the position. NOTE: For those that are to receive automatic step pay increases, you must enter the Salary Admin Plan, Grade and Step. Select the Compensation tab. Use the Compensation page to specify the compensation rate for the employee. Select the Default Pay Components button to execute rate code defaults. Rate code defaults specify previously defined values. In the Rate Code field, select the NAANNL Comp Rate Code from the look up icon (Use the HRLY Comp Rate Code for Hourly Employees). Enter the Comp Rate amount in the Comp Rate field. 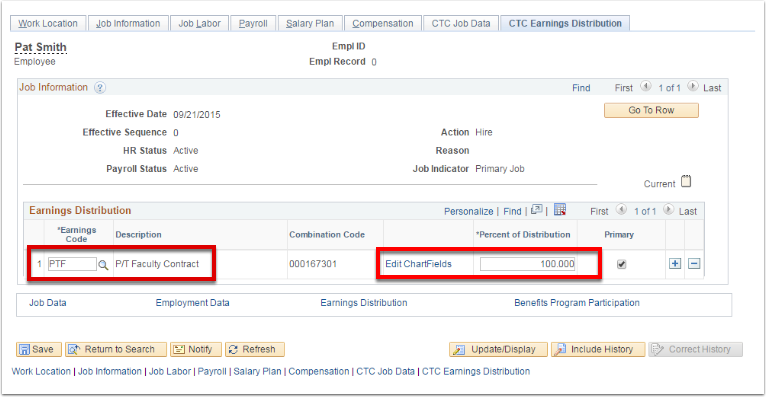 Select the Calculate Compensation button to calculate the employee’s compensation. 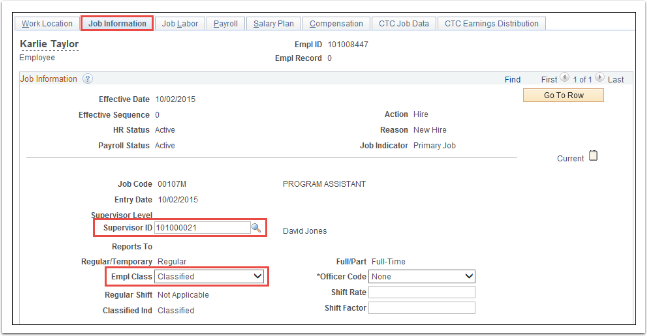 Select the CTC Job Data tab. Enter the Leave Accrual Date. Enter DRS Calendar. (This is dependent on Employee Type. Refer to the DRS website for applicable calendar options). Contract Begin Date and Contract End Date Fields will also be dependent upon this information. 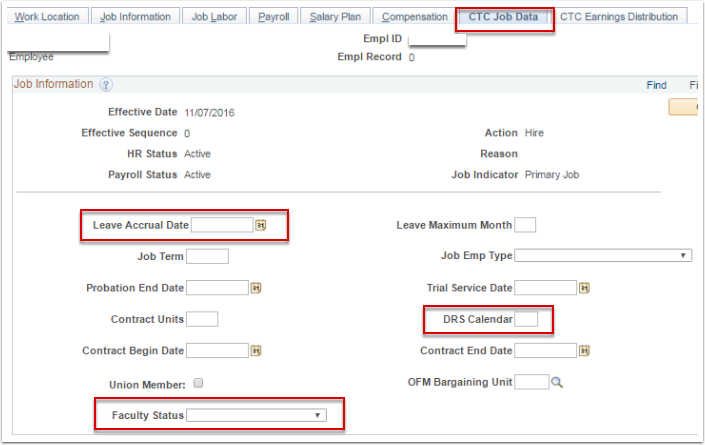 See QRG, Using DRS Calendars: Import DRS Calendar Questions on Hire or Program Change. Select the Faculty Status (Optional). 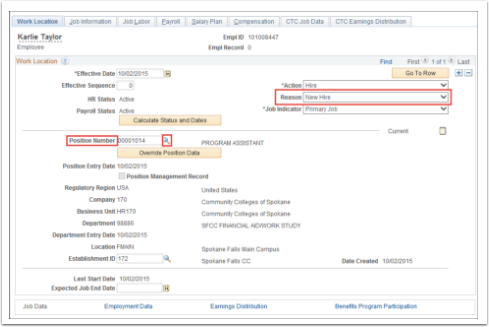 Select the CTC Earnings Distribution tab. Enter the appropriate Earnings Code. Select the Edit Chartfields link, to select a Combination Code . Enter the Percent of Distribution assigned to the selected Combination Code. Select the Employment Data link at the bottom of the page. Select the Time Reporter Data link. Select the Time Reporter Type (Elapsed or Punch). Enter the Elapsed OR Punch Time Template (should coincide with the Time Reporter Type you selected). Select the appropriate Workgroup from the menu options. Select the appropriate Taskgroup from the menu options. 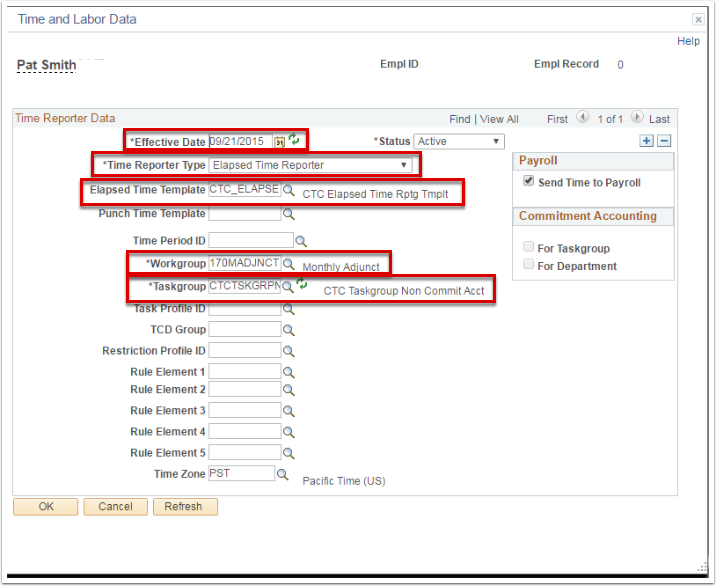 BE ADVISED: The data included in the Organizational Instance and Organizational Assignment Data sections of the Employment Information page, will auto-populate once the entire Job Data record is saved. For instructions on how to update this information see QRG for Updating Employment Data. 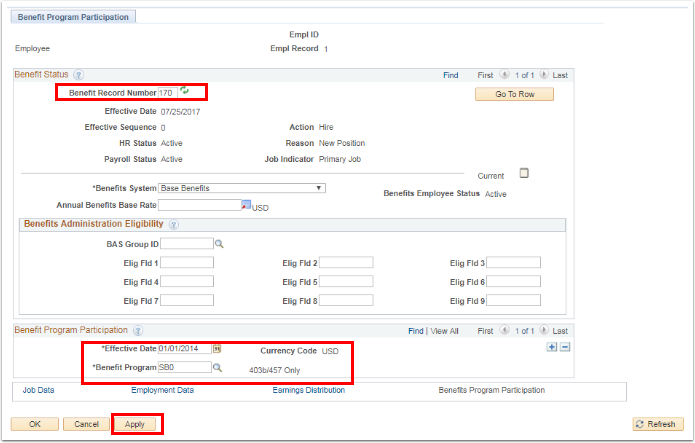 NOTE: If you have the security access to add a Benefit Program, you will see the Benefits Program Participation link at the bottom of the Job Data page. The Benefits Program should be set up during the Add a New Employee and Job Instance process. If you don’t have security access for this action, the Benefits Specialist should be notified to take this action. Your college should determine a repeatable business process to ensure that this part of the new employee setup is not missed. Select the Benefits Program Participation link. Enter your college code in the Benefit Record Number field. Select the Benefit Program lookup icon. Select the desired benefit program. NOTE: To enroll new employees in benefits such as Saving and Spending Account Plans, Supplemental Life and AD&D, see the individual QRGs that specifically address these processes. Click the Job Data link to return to the Job Data page. You have successfully Added a Job Instance! Enter Empl ID and select the Search button. Enter the DRS Option (or select from drop down menu). Enter Ret Deduction Indicator (or select from drop down menu). Choose Retirement Plan Effective Date. *NOTE: Current Retirement Plan will populate automatically. You have successfully set up the DRS Calendar for this employee. You have now completed the process for Adding a New Employee and a Job Instance.